Whether they use pigment- or dye-based inks, one almost universal problem with inkjet printers is that their output onto plain paper can be ruined by smudging, either merely by wiping a hand across the page or by a wayward drop of water. By contrast, the DX8400 uses Epson's cunning Durabright inks, which are resin-based. The ink is almost dry even as it hits the paper and sticks with amazing tenacity thereafter, producing a level of robustness normally reserved for laser printer output. This comes at a price, however, with running costs being higher than average. Using a four-ink system, the DX8400 makes a great job of mono and colour document printing, but the colour space is only barely adequate for photo printing. On specialist photo papers contrast is pretty good, but fine graduations in colour and the subtleties of skin tones are a little lacking. More impressively, the DX8400 makes a better-than-average job of outputting photos on plain paper. Printing from memory cards and photocopying are handled with ease, thanks to the provision of a colour screen and simple yet effective onboard controls. Mono photocopying was sometimes let down in our tests by the presence of jagged font edges. Colour copying was a more moveable feast, as our review sample had the habit of applying a rather warm colour balance to scans and copies, giving photos in particular a noticeably orange colour cast. 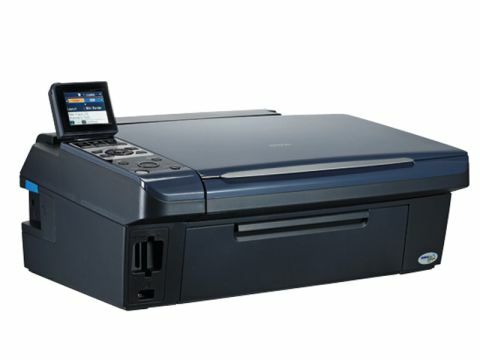 Overall, the DX8400 certainly isn't a good choice for the photo purist, but on the other hand it has a lot going for it for truly robust document printing.